This is the true joy in life - being used for a purpose recognized by yourself as a mighty one; being thoroughly worn out before you are thrown on the scrap heap; being a force of nature instead of a feverish selfish little clod of ailments and grievances. Imagine what you desire. Will what you imagine. Create what you will. It is necessary for the welfare of society that genius should be privileged to utter sedition, to blaspheme, to outrage good taste, to corrupt the youthful mind, and generally to scandalize one's uncles. A Native American elder once described his own inner struggles in this manner: Inside of me there are two dogs. One of the dogs is mean and evil. The other dog is good. The mean dog fights the good dog all the time. When asked which dog wins, he reflected. A reasonable man adapts himself to his environment. An unreasonable man persists in attempting to adapt his environment to suit himself. Therefore, all progress depends on the unreasonable man. If you cannot get rid of the family skeleton. You may as well make it dance. In the arts of life man invents nothing; but in the arts of death he outdoes Nature herself, and produces by chemistry and machinery all the slaughter of plague, pestilence, and famine. Alcohol is a very necessary article... It makes life bearable to millions of people who could not endure their existence if they were quite sober. It enables Parliament to do things at eleven at night that no sane person would do at eleven in the morning. If the lesser mind could measure the greater as a footrule can measure a pyramid, there would be finality in universal suffrage. As it is, the political problem remains unsolved. Gambling promises the poor what property performs for the rich--something for nothing. 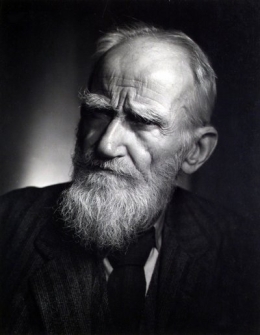 105 quotes by George Bernard Shaw.